Daihatsu’s fresh and funky new Materia mini-MPV offers a user-friendly mix of vast interior space, fairly low CO2 at 169 g/km and 46.3 mpg (manual) and quirky, individual styling. 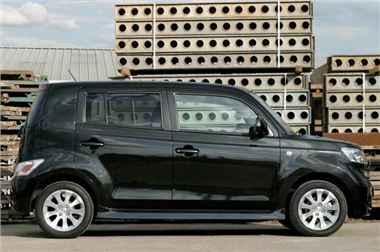 As part of Daihatsu’s Spring Savings Campaign, the Materia (manual only) – can be on the road for just £10,770 and available with a further £1,000 discount if ordered before June 30th. It’s easily big enough for five adults to travel in style and comfort, or a large family to be perfectly accommodated yet is four inches shorter than a VW Polo. Innovative design included the sliding rear bench seat, which offers a variable rear legroom/boot space adjustability – from 21-inches ‘knee room’ to just four – if you wish the boot to be bigger (creating 181 to 294 litres of space). Then there’s the option of folding the rear bench flat, creating a huge loading area (619 litres), with plenty of headroom – ideal for that piece of flat-pack furniture, or even your rapidly growing family! Lively, free-revving, Toyota derived 103.3 PS, 1.5-litre, 16V, chain cam VVTI engine combines excellent fuel economy with brisk, responsive performance and a 106 mph top speed – leaving other mini-MPVs in its wake. Inside, the Materia offers air-con, central locking alarm, CD stereo, centrally-mounted integral speedo/rev counter/odometer, electric (tinted rear) windows and mirrors and pockets/cup holders/storage galore. And, all inclusive for just £10,770, with a five-year, unlimited mileage warranty, five years’ UK roadside assistance and eight years’ anti-perforation cover.